I’m guessing this book does NOT espouse the eating of nuggets, fries, hot dogs and mac-n-cheese. Still, I hope it’s a good sign that your post and my comments here are making me hungry. I promise not to eat junk food for breakfast. Or drink wine. Go, Charlene! You are a superstar and your words are spreading. Charlene, I need this book more than you know! Since my kids are pre-tween, maybe there is still hope for us all. There IS hope, Kim. I promise! Congratulations on the book, Charlene!. Woo Hoo!!!! So thrilled for you! I just followed the link and saw your lovely picture inside the book. 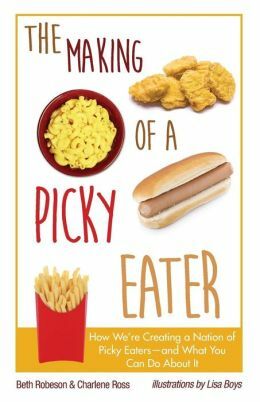 I hope this book transforms you and Beth into “Picky Eater SUPERHEROES!” Or at the very least scale the heights of the best seller lists and win numerous literary awards (that’s still kind of superhero-ish)! Also, stop by my house and use your super powers on the picky eaters that came outta my womb. Wishing you and Beth much literary success! Congratulations, Charlene! All these years you’ve been working on your novel, you’ve been keeping this one a secret?! Since I’m so happy for you I won’t be offended 😉 I definitely wish this would have been published before I ruined my kids’ eating habits- now I am just hoping they will give in to peer pressure and try oysters and brussel sprouts during their college years! You never know Monica, it could happen. Suddenly (or I guess not so suddenly) my kids are trying lots of things they’ve never tried before. It’s been nice to add a few more things to the dinner rotation! haaaa. Under procrastination in the Webster, my photo is there! This is fantastic!!!! I know a writing group who would LOVE to read it too. Congrats, my friend. Thank you Miss Laurel! Mwah!